Here it is, already ten days into the New Year. So far I haven’t noticed a lot of difference between 2013 and 2014. It’s customary to make resolutions. At least I think I am supposed to make resolutions but like I heard Rachel Ray say on her show one of the days during the holiday, “I fail enough without setting myself up!” I agree. So no resolutions for me! However, my friend Robyn posted something intriguing on Facebook. Basically she said she chooses a word for the year. It sounded interesting. I thought I could do that. But it’s harder than it sounds! Try it. Think of a word that you could use to do some of the things that resolutions state but without the concrete statement. So I thought. I came up with a few, narrowed it down and finally settled on one. My word for the year is “Embrace”. Embrace means a lot of things; to hold someone closely, to accept or support, as in an idea or practice, and to include or contain as in a part of something bigger. I want to embrace the changes to come, love the people I love and maybe include some new ones, and to celebrate all of the opportunities I have, both in my life and in my job! When faced with a challenge I want to look at it as a chance to grow instead of a chore. It won’t be any easier than keeping resolutions. But maybe it will result in more positive changes because it seems, to me anyway, that it’s broader than specific statements. I guess we’ll see! I’ve already made a couple of things this New Year. Funny how much you can get done when work doesn’t get in the way! There’s some knit and some crochet. 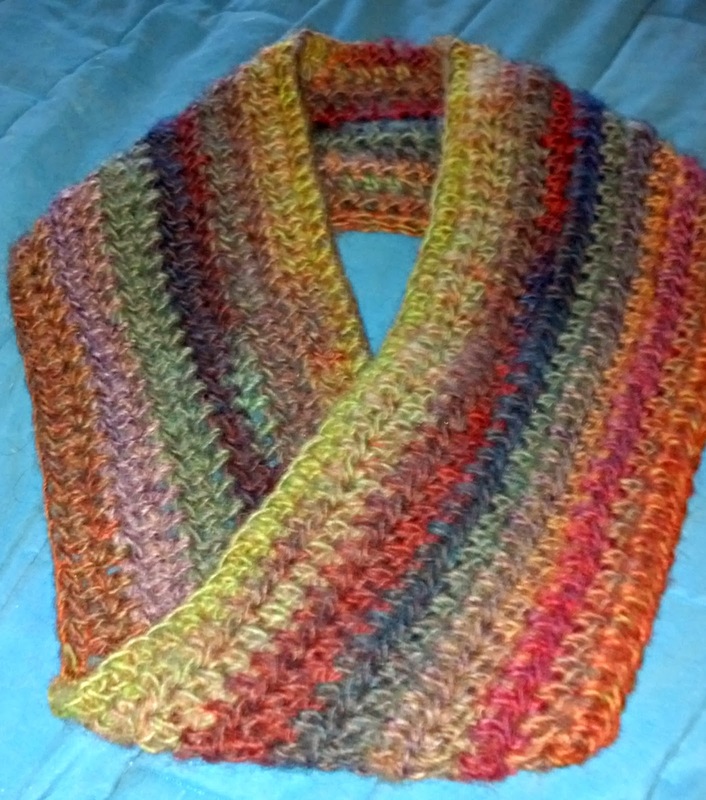 The Candy Cowl isn’t really finished. I’m going to add some ‘stuff’ because it’s a handspun that reminded me of art yarn. But since it didn’t have anything added in I decided I’d just add it myself! I’m not sure how warm the little gloves would keep your hands but they look good! 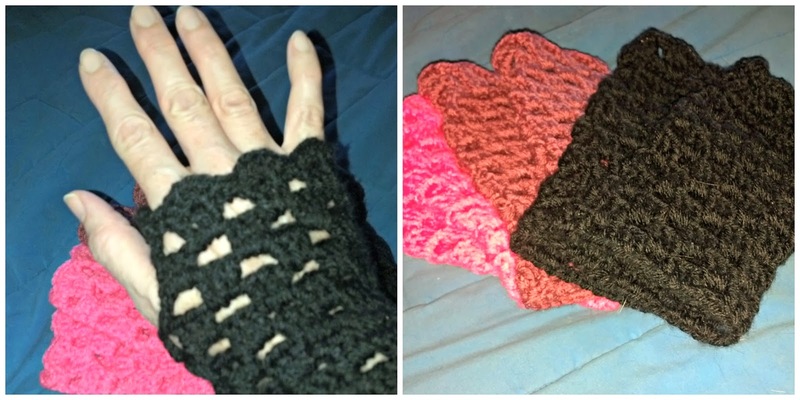 Crochet Openwork handwarmers. Fun and quick! And the One Good Turn cowl is a great stashbuster for those orphan skeins. I like how it turned out. Lion Brand Amazing. Turned out pretty! I hope to keep up the momentum. We’ll see! You are embracing very well so far! 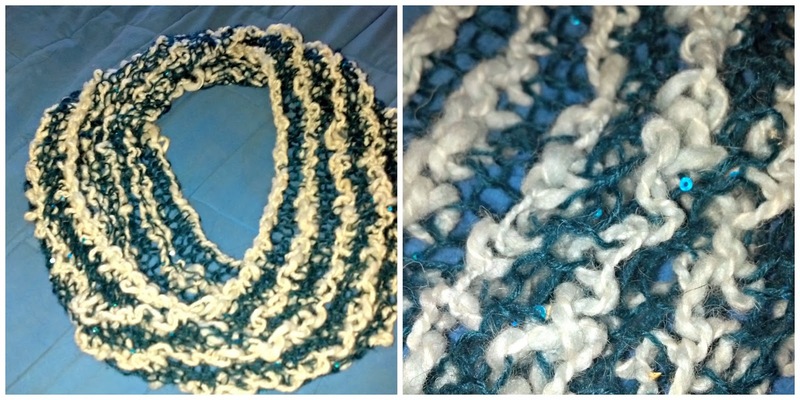 That One Good Turn cowl is a mobius strip! Cool!